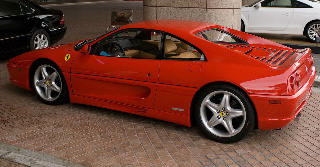 At launch, the Berlinetta was priced at $130,000, whilst the other two variants both had a price tag of $137,000. It used a steel monocoque chassis and tubular engine sub-frame, coil spring independent suspension all round with gas-filled shock absorbers that were activated electronically, and anti-roll bars. In terms of aerodynamics, this sports car was fitted with a complete body under tray that prevented lift when driven hard. This addition increased the selling price by $6,000, and allowed gear changes to be performed in a matter of milliseconds, and left the driver's attention centred on the road, and not distracted by manual gear changes. 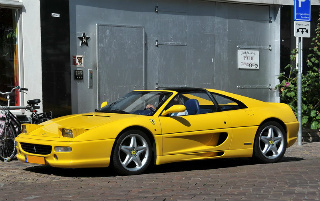 This change was meant to emphasise the introduction of the five valves per cylinder in the 355. Each of the three 355 sports cars were powered by a mid-engined, rear wheel drive, 3.5 litre, double overhead cam, V8 unit whose capacity had been increased from 3.4 litres, in the 348 Series, by increasing the bore by 2 mm. It developed 380 bhp at 8250 rpm, and 268 ft/lbs of torque at 6000 rpm, which produced a top speed of 183 mph, and a 0-60 mph time of 4.9 secs. However, the main feature of the engine was the addition of a cylinder head that contained five valves, which improved intake efficiency and increased performance. Furthermore, the compression ratio was raised to 11:1, and some of the engine's internals were constructed of lightweight materials, such as the use of titanium alloy for the con rods, and aluminium alloy pistons. 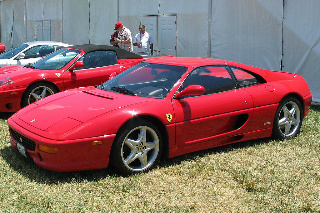 The 355 Spyder convertible was introduced in 1995 and featured, for the first time on a Ferrari, a soft top that was electronically activated automatically. 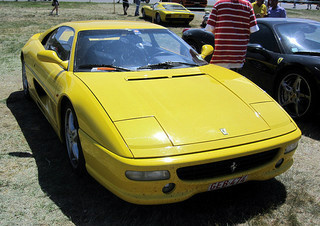 This featured a Targa-style hard top roof that could be stored behind the seats, or in the front boot, when not in use.